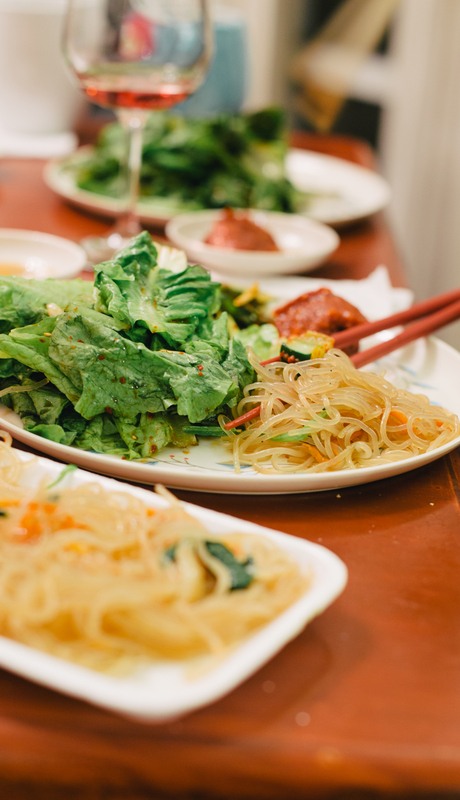 Having samyeopsal-gui is a communal affair and is great for gathering a group of friends for a dinner party. There are two different salads, two sauces, raw sliced garlic, raw sliced green chili and rice to eat with your pork belly just off the grill. Before starting any preparations, cook the rice to serve later. One salad is comprised of julienned green onions only. The other is comprised of coarsely chopped lettuce. Combine all the salad dressing ingredients and mix well. Pour half of the salad dressing into the green onions and mix together. Use the remaining salad dressing for the chopped lettuce to create the second salad. The other bunch of lettuce can be used as leaves to wrap your pork belly with the rest of the ingredients. 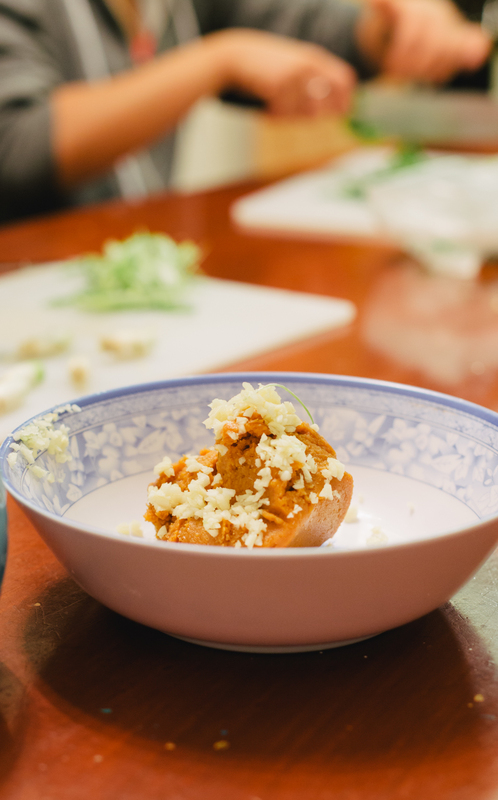 These ingredients can be placed on communal plates or portioned to each person. Each individual should have a sesame oil, pepper & salt combination, sauce (ssamjang), raw sliced garlic and raw sliced green chili. In a separate sauce dish or sectioned sauce dish, add the salt and pepper on one side/corner of the dish. Pour the tablespoon of sesame oil over the spices. In a small mixing bowl, combine all the ingredients of the ssamjang and mix well. Then, portion the sauce for each individual in another part of the sectioned sauce dish or straight onto the individual’s plate. 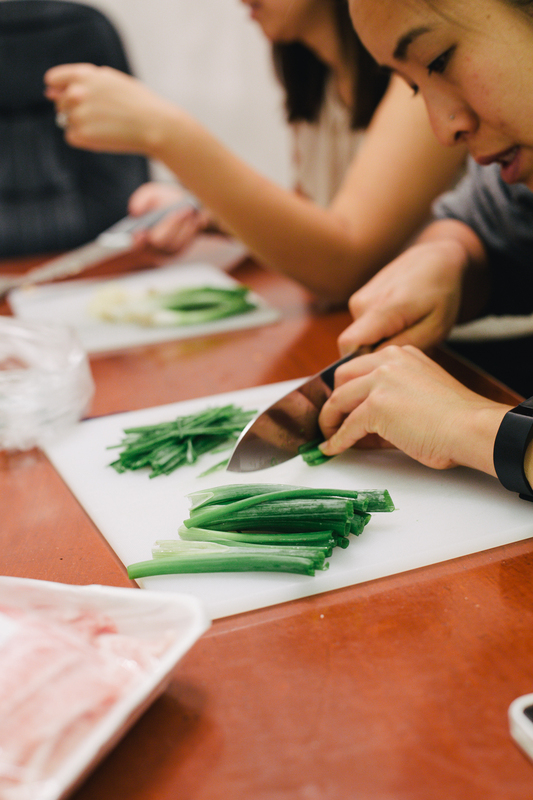 Give each person some sliced garlic, sliced green chili, rice and kimchi to start. Now that you have the whole set-up, where do you begin? The grill pan should be placed on the portable stove at the center of the table. Add a few slices of the pork belly to start grilling, allowing some of the fat to coat the grill pan. Add a few onions to flavor and eat. From here, it’s pretty much every man for himself. 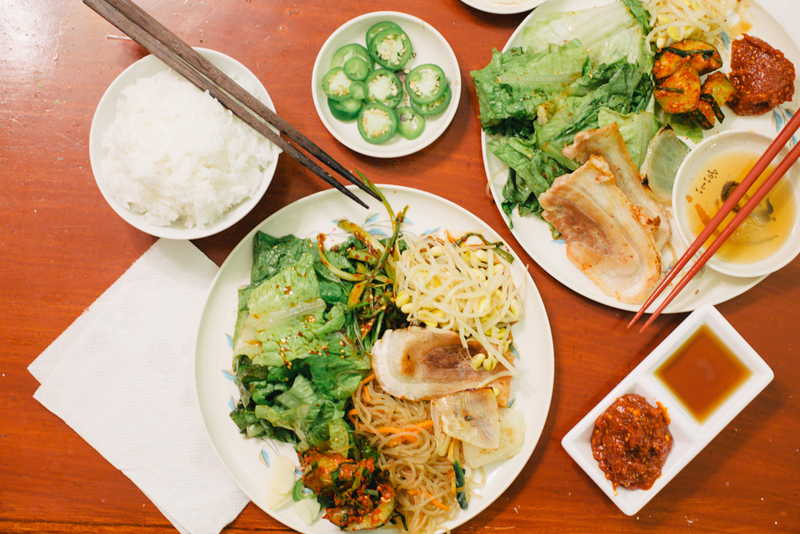 Each individual prepares a lettuce wrap or lettuce salad with rice. 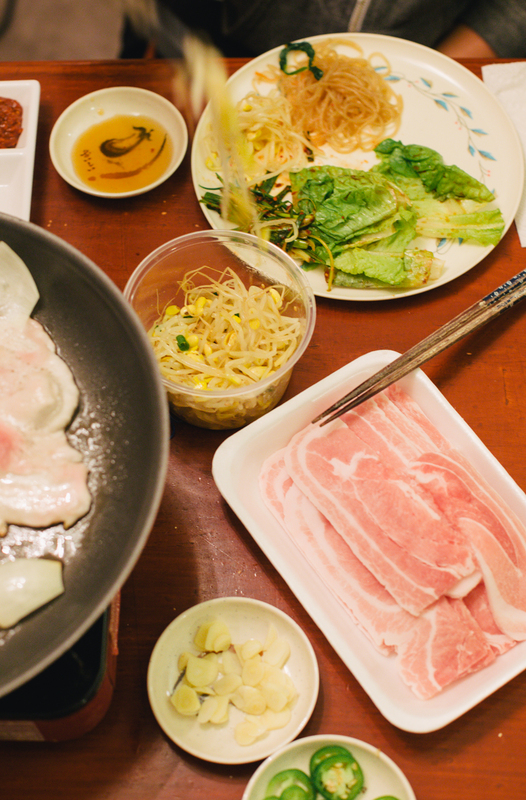 Then, he/she can grab a slice of grilled pork belly and/or onions from the pan and dip the pork belly into the sesame oil, salt & pepper combination. The pork is placed onto the lettuce and rice preparation. Add a very small amount of the sauce, one garlic slice, one green chili slice and/or a little green onion salad on top to your preference. Once your compilation is complete, time to stuff that whole masterpiece in your mouth and enjoy the spectrum of flavors. It is only a matter of time before you figure out what combination of ingredients is perfect for you. Man, this whole explanation has got me (and me, nanette!!!) craving for this mouth-watering dinner again. I know that it seems like a lot of steps, but the preparation is totally worth it. 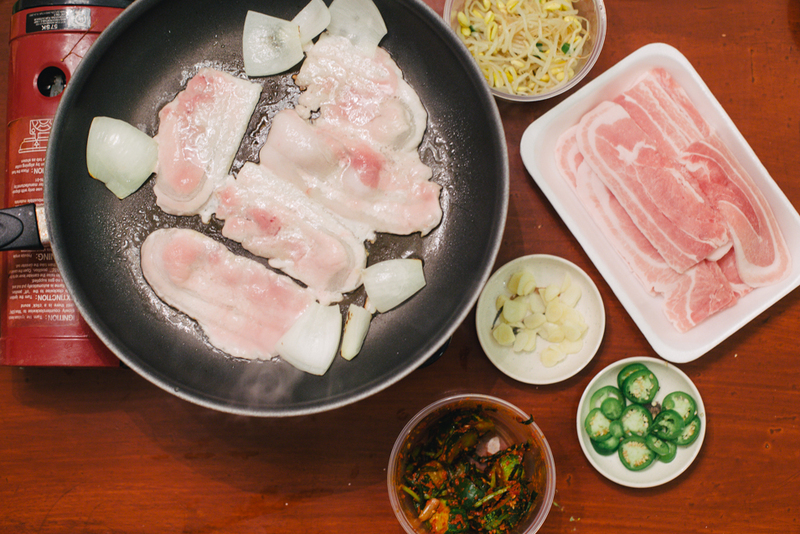 Try this samgyeopsal-gui recipe out and let us know how it goes!